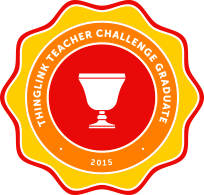 Teacher scenario – the question posed in this scenario is of great interest to me. I am in the early stages of supporting some colleague to plan a session with an international focus. I too have been thinking about strategies to make this happen and I’ve come across something shared with me by a student (@TheTechyTA) called Mystery Skype. 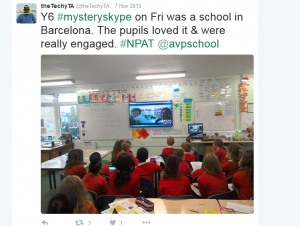 You can read about his experience of it here – Mystery Skype in school. I’ve been wondering if I can use this with the students. If anyone has any contacts abroad who work in education at school level, especially as teaching assistants I’d love to hear about them. Task 1 reflecting As part of a work project (Teaching with Tablets MOOC) my colleagues and I are using Slack as we work on designing each week of the online course. We can access this from phones, Ipads and computers so it is very accessible for the whole group. Its the first time I’ve used it so its early days in terms of evaluating it. I know Slack has come up in the #BYOD4Lchats as well but I haven’t found my way to it yet! 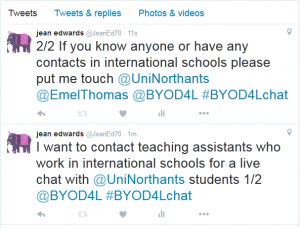 Task 2 making – I’ve tweeted to see if anyone has any contacts with teaching assistants in international schools in relation to the session I’m seeking to organise with my colleagues (see above). I’ve included a colleague in the tweet to enlist her support in looking for people as she is one of the tutors who will be leading this session. I realise the possibility of doing this online experience alongside other colleagues in the same university as this task in particular would be so helpful and productive. 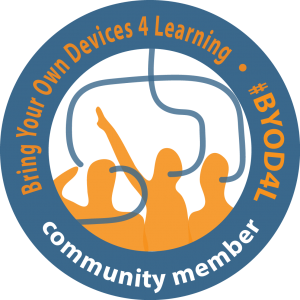 I hope next time BYOD4L runs to enlist a group of colleagues to take part, maybe from within the division that I work in as I think it could be a powerful way of developing our use of devices, something that will be essential in the next few years as the nature of out university and our jobs change. This entry was tagged app, BYOD4L, image, images, ipad, iphone, learner, learners, learning, photo, pupil, share, sharing, student, students, TA, teaching, teaching assistant. Bookmark the permalink. I’m having a bit of mental block and I just can’t work out how to access Slack. Maybe its because I’m in a team on it already. I can’t seem to sign into another team. I might need to send you an invite.